Artwork of a Super Scope from Ultimate. 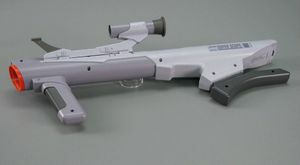 The Super Scope (スーパースコープ, Super Scope), known as the Nintendo Scope in the PAL version of Super Smash Bros. Brawl and Super Smash Bros. Ultimate, is a shooting item that appears in Super Smash Bros. Melee, Super Smash Bros. Brawl, Super Smash Bros. 4, and Super Smash Bros. Ultimate, based on a real-life peripheral from Nintendo. The Super Scope was released in September 1992 in the United States and European markets (the latter as the Nintendo Scope), shortly after the release of the actual Super Nintendo Entertainment System; the item was not sold in large quantities in Japan. The Super Scope was intended to act as a successor to the Zapper, and as a result, functionally acted almost identical to its predecessor. Both were light guns, though the Super Scope was wireless and took on a shape more similar to that of a bazooka. In both the United States and Europe, the peripheral came bundled with Super Scope 6 (Nintendo Scope 6 in Europe). The game featured six games within it that all acted as introductions to the Super Scope itself. In one of these games, Confront, the player is tasked with stopping an invasion of enemy ships; in order to do so, they were given an endless stockpile of ammunition that they could fire at these ships. These shots were small and yellow, and these rounds would later reappear as the primary output of the weapon in the Smash Bros. series. The Super Scope in Melee. Peach firing a Super Scope in Super Smash Bros. for Wii U. In both Melee and Brawl, the Super Scope acts as a long-ranged weapon that the user can wield in order to not only increase their range, but their raw power as well. If the player constantly taps the A button, they will fire a constant stream of small shots, each of which do little knockback and damage, creating a "trapping" effect. When using it against aerial opponents, it will produce very weak meteor smash, making it ineffective against opponents close to the stage. Holding down the A button, however, charges the weapon, allowing for stronger and larger shots; at full power, the shots can deal in excess of 20% damage, with significant knockback potentially KOing opponents, as well as an added flame effect. Super Scope shots are considered to be energy-based projectiles; as a result, they can be reflected and absorbed. In addition, the projectiles can potentially be deflected by weakly angled surfaces. The Super Scope has limited ammunition reserves in it. Its "ammo" is 48, and different charge levels of shots will increase the ammo used. Small shots will use 1 ammo, a slightly charged shot will use 2, then 4, 8, and 16 (max). Firing 48 small shots or three fully-charged shots is enough to deplete the Super Scope, and attempting to use it after it runs out of ammunition causes it to fire nothing but a puff of smoke; at this point, the player can throw the weapon at opponents for a little extra knockback and damage. In Brawl, the Super Scope became slightly more flexible than its Melee incarnation. A buff added to all projectile weapons meant that characters could run and jump while using projectiles; in the case of the Super Scope, this makes it easier to land charged shots. However, uncharged shots no longer pass through enemies, making it more difficult to trap multiple enemies within a steady stream of shots. The weapon received another buff in Super Smash Bros. for Nintendo 3DS, as the Super Scope now has 72 shots available for use instead of 48; as a result, it is now possible to fire five fully-charged shots instead of three. The Super Scope, however, did receive a nerf: its shots are narrower and more elongated compared to the two previous games, making their overall hitbox size considerably smaller. Peculiarly, the shots are not narrowed for the Wii U version and keep their spherical shape from Melee and Brawl. 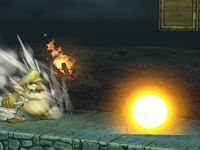 In Brawl, the momentum of a projectile will affect the damage a character will receive; these are recorded in bounces. These are the stages of damages and knockback for the Super Scope in Brawl. There are a total of eight stages with seven stages of charging and the fully charged stage, each stage increases the damage and knockback that the Super Scope does. 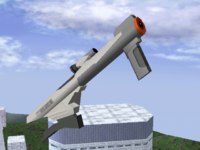 The Super Scope is one of the many trophy items that can be obtained during the Smash Tour mode. It has a red base, and when used it will allow the player to start one battle holding a Super Scope. A peripheral device for the Super Nintendo Entertainment System, the Super Scope is a wireless weapon that shoots infrared light to a receiver placed on top of the television. In Super Smash Bros. Melee, it can be fired rapidly or charged up to release a more powerful blast. It only has enough energy for 3 charge shots. A bazooka-shaped peripheral for the Super Nintendo Entertainment System that was used wirelessly with an infrared sensor placed on top of the television. In Smash Bros., it can be fired rapidly or charged up. In Super Smash Bros. Melee, you could not move while shooting it, but in this game, you can move and jump while blasting! The wireless weapon from the SNES era can be used kind of like a bazooka in battle. Press the attack button rapidly to spray shots, or hold it down to charge up a powerful blast. The weapon's ammo won't last forever, however, so try not to get caught without juice left in your batteries. This wireless peripheral for the SNES can be used as a kind of bazooka in this game. And it comes with two different firing modes! Press the attack button repeatedly or hold it down to try them out! However, depending on how you use it, the batteries might run out pretty quick. And if they do, the fun's over. That's it! Equipping the Landmaster, Zero (Metal Gear Solid 3), Auto, Formula or Tank & Infantry Support Spirits will give the player a Super Scope at a start of a match. Artwork of a Super Scope from Brawl. Wario holding a Super Scope. 2 shots of equal energy clashing with each other. The Super Scope in Smash 4. Zelda firing a Super Scope in Ultimate. The Super Scope was intended to be held somewhat similarly to a rocket launcher, with the back of the weapon resting on the user's shoulder and the user peering down the scope. While some characters wield the weapon correctly, such as Fox and Peach, some instead hold the weapon underneath their shoulder more akin to a rifle, while others hold it in more peculiar ways. The Super Scope's descriptions in SSB4 mentioning the depletion of batteries might be a reference to the real-life Super Scope's infamous battery consumption, being one of the main reasons for its lack of success. This page was last edited on April 19, 2019, at 09:37.